There are just a few things to set up: the Basic Options and any Templates you might like to have. The first option you have in the setup of your Engagements pertains to how and when your clients are allowed to schedule appointments with you. This may seem its own separate subject, but there’s a reason for its inclusion here. Having a client set up in an Engagement means there are some rules about scheduling appointments with that client: the question “does this client have any sessions left?” now has an in-app answer. Never allowed: This means you, as coach, will always be responsible for booking appointments with clients. Allowed only within the limits of an Engagement: This means that any client who’s NOT been added to an engagement will not be able to request appointments with you. In other words, a client must be in an active Engagement with you in order to be given the privilege of scheduling with you. Allowed unless and Engagement says otherwise: This means appointment requesting is generally available (per the rules of the Appointment Types you offer, of course!) to clients UNLESS they have ever been set up in an Engagement. Once that’s the case, the rules of the Engagement (with respect to hours allocated and the date range) dictate whether or not a given client is allowed to book an appointment with you. This is a great option if you’re transitioning from not using Engagements to using them, or if you will generally not be using Engagements (because you wouldn’t want your lack of using Engagements to short circuit clients’ ability to book with you). Here’s a fun little trick that this setting makes possible and is not exactly related to Engagements: notice how it says this setting can be overridden on a per-client basis? That means you can segment your clients in a particular way, separating, for example, those who have only purchased a group coaching experience with you from those who have upgraded to the one-on-one plan (such a tiered offering is a powerful structure for a coaching business, you should consider doing it if you don’t already!). The next setting is to do with marking appointments as Verified: you can do this manually, but the system will automatically do so if you choose. Verified (or not) is essentially your way of telling CoachAccountable that “yes, this appointment DOES count towards the allocation of hours” or “no, it doesn’t”. Your decision on this front will usually lie with how you manage cancelled/rescheduled appointments or no-shows (more on that below). 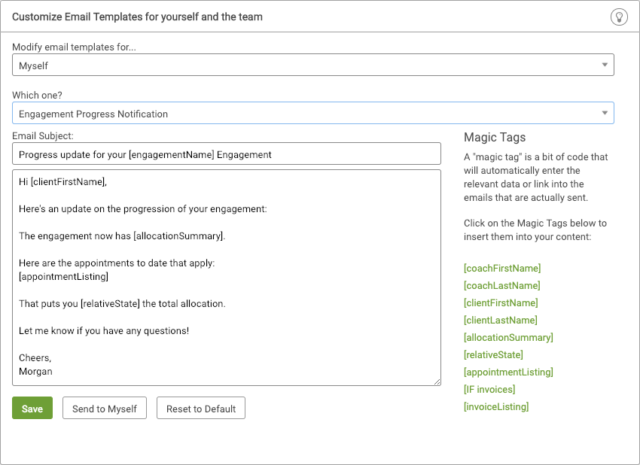 Engagement Templates are your way of defining your standard packages. You can of course set up an Engagement with a given client however you like, but it’s quite likely you’ll have one or more standard types of engagements. Templates, therefore, allow you to define those once and use them again and again. 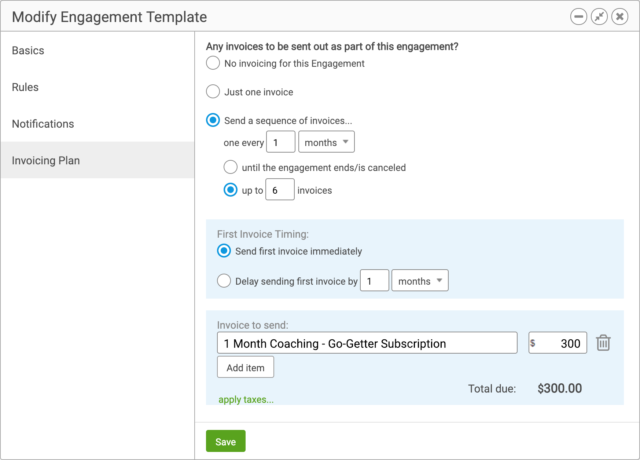 Much like a specific Engagement, an Engagement Template is broken into 4 sections: Basics, Rules, Notifications, and Invoicing Plan. First give your Engagement Template a simple, descriptive name. The client may see this name if you create a client-facing notification (more on that later). For Team Edition accounts, you’ll choose who should generally manage this type of Engagements. This is the coach to whom coach notifications will go (things like, “Here’s how the Engagement is progressing”). Note that, like everything else here, you can change this for a particular Engagement with a given client – you’re just setting the default here. Next, set a duration for this type of Engagement (or they can be set to run with no particular end date, i.e. until the allocation is used up). The allocation of an Engagement is given by the total hours OR the number of appointments. If your appointments are all one hour long, these are equivalent. However, if some of your sessions are, say, an hour and some 30 minutes, measuring by hours may be more appropriate. There are 2 types of rules to set: rules that govern WHICH appointments should towards (the allocation of) an Engagement, and whether or not a client is allowed to schedule in excess of the allocation. Filtering by appointment duration can be handy – say you offer quick 15-minute check-ins at no additional cost. In that case, you could set this to only count sessions that are between 16 and 180 minutes. Should Group Appointments that your client attends count towards the allocation, or just the one-on-ones? You decide. Finally, if you really want to get into the nitty-gritty details of which appointments count, you can carve out exceptions (or define specific inclusions) based on appointment name. You can, for example, count ONLY appointments with certain names (perhaps only ‘Weekly Call’ and ‘Monthly Call’ count, but ‘Mastermind Call’ and all your other types of calls don’t). Or you only count appointments that do NOT have certain names (e.g. ‘Free Intro Call’ should always be free, but all other types can count toward this Engagement if not ruled out by our settings above). Partial matches count, so you can type in just one of the words that’s in the appointment type’s name. ‘Free’ will therefore filter out my ‘Free Intro Call’, as well as any other appointment types that contain the word ‘Free’. So my ‘Freebird’ appointment won’t count. The sending of notifications is triggered based on how many appointments have been scheduled, actually occurred, or been successfully verified for this person, relative to the allocation. Choose to notify either the coach or the client when the number of hours/appointments reaches a certain threshold. If you’ve measured your allocation in hours, the threshold shows in hours; if measuring by number of appointments, the threshold is measured in appointments. The setting here is a fairly simple sentence you can construct to your liking. 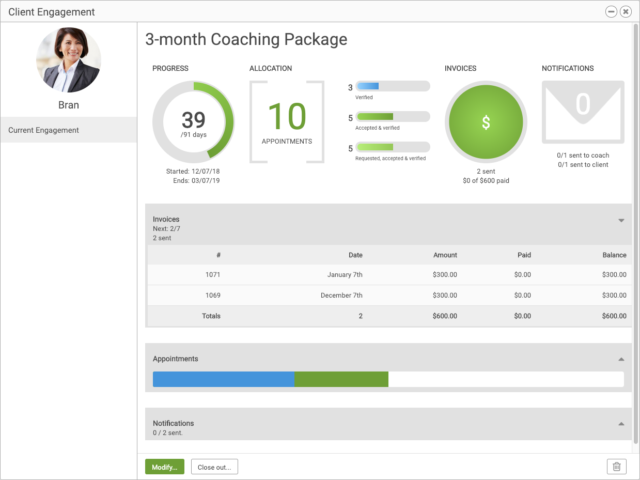 As part of an Engagement, CoachAccountable will generate, send, and automatically collect payment on invoices (when possible) on a recurring basis, just perfect for offering any sort of subscription or installment billing for your services. The invoicing plan is defined as a single or a series of invoices (sent on whichever recurring schedule you like), with whatever delay of the first invoice. Set up the invoice(s) that should be issued as one or more line items, with or without tax applied. And that’s it! You can create one or more Engagement Templates to use over and over for the types of coaching packages you offer. Notice the available magic tags. [appointmentListing] shows the client a neat little table with all the previous appointments that have counted toward the allocation so far. This helps ensure you don’t run into any surprises if a client’s unsure which sessions have been part of the package. When one or more invoices exists for the Engagements, [invoiceListing] shows a neat little table listing the invoices and any outstanding balances. Invoices with outstanding balances will come with a link by which your client can go pay the invoice. 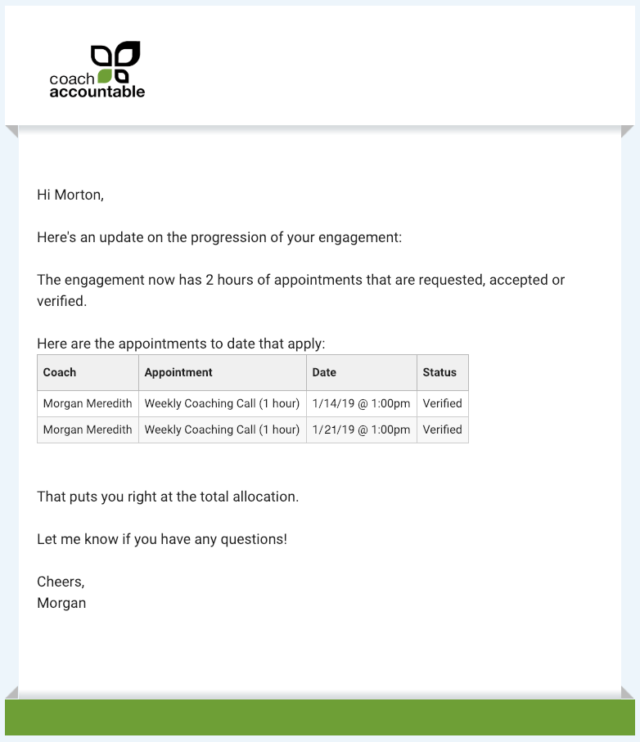 Here’s what it looks like in an email (subject line is ‘Progress update for your Monthly Individual Coaching Engagement’, where Monthly Individual Coaching is the name of my Engagement). Morgan coaching Morton – probably confusion now and then! Now you’ve got one or more templates set up, so what? The real magic happens when you set your clients up in an actual Engagement. In your listing of active clients, you’ll notice a handshake icon hanging out in the lower right of each client (next to the settings and download buttons). Click this to bring up that client’s Engagements. If the client isn’t in an active Engagement, click ‘+ Engagement’ to add him/her. Here’s where you’ll be able to pick from your Engagement Templates to save you some work (and you’re also free to start from scratch). Setting up an Engagement it essentially the same as setting up a Template: get everything the way you like it and just hit the ‘Create’ button below. Once an Engagement is created, you’ll be able to see a couple new things. 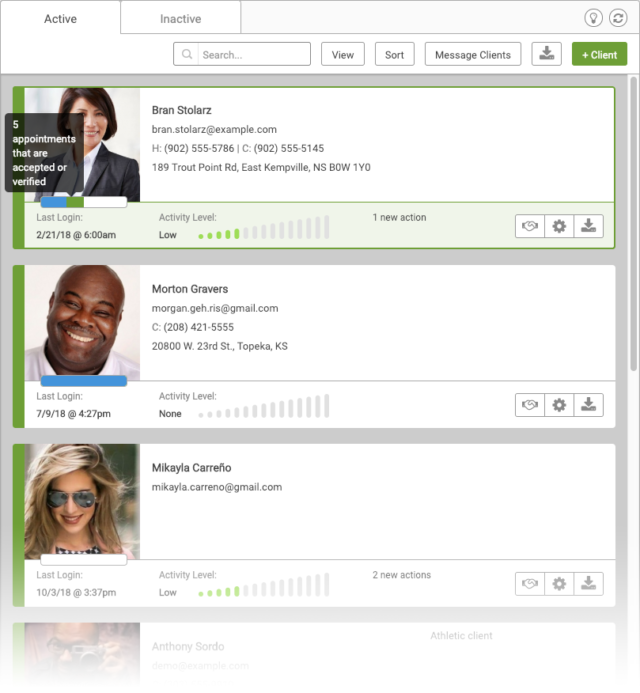 Firstly, in this area (a client’s page >> Engagement) you’ll have this easy-to-view display of the entire Engagement. The sections entitled Invoices, Appointments, and Notifications can all be expanded or collapsed using the arrows on the right side. Back in the client listing (and near the avatar of a given client’s Client Page), you’ll now see a progress bar. It’ll show a break down of requested, approved and verified appointments so you can, at a glance, gather how far along that client is in an Engagement (relative to the allocation). Hover over any piece of the progress bar to find out exactly what it means. A note on client sorting: you can now sort your client list by Engagement, too. Just click Sort >> Engagement. Clients who are not in an Engagement will be at the bottom of the list. Let’s go into further detail of what appointment verification means and where it matters. When you verify an appointment, you mark that it indeed counts: i.e. the session did occur, or maybe the client cancelled but it was too close to the appointment, or it was a no show. Since everyone’s cancellation policy is different, and unexpected circumstances happen with both coaches and clients, the system lets you explicitly mark an appointment as verified or not. These designations are intended to make the functionality of Engagements smart and busywork-free on your part. A requested appointment is one a client has requested but you haven’t yet accepted. 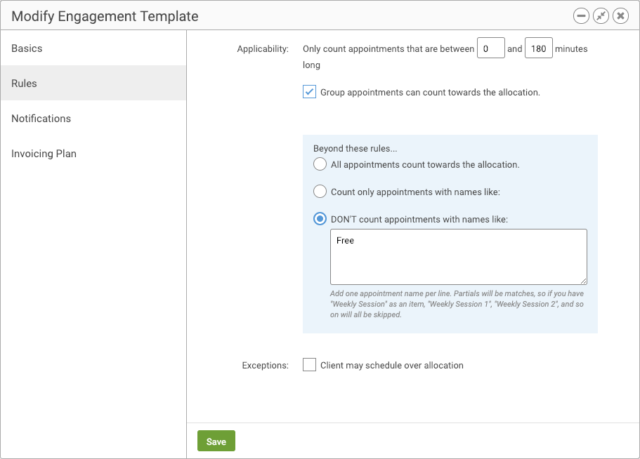 In Settings >> Appointment Config, you have the option to allow clients to request to schedule with you. These requests can be either automatically accepted, or stay as requests for you to approve. An accepted appointment is one that is no longer considered just a request, but one that coach has confirmed is actually happening. (When you, the coach, are the one setting the appointment, it is naturally deemed accepted). A verified appointment is one you’ve marked (or has automatically been marked) as indeed counting toward the allocation. If they’re set to automatically verify, they’ll do so as scheduled UNLESS the appointment is cancelled beforehand (similarly, appointment requests that you never actually accepted won’t be automatically marked as verified). Recall the Notification settings (both for Templates and actual Engagements): they are dependent on the total number/hours of verified, requested, or accepted appointments. 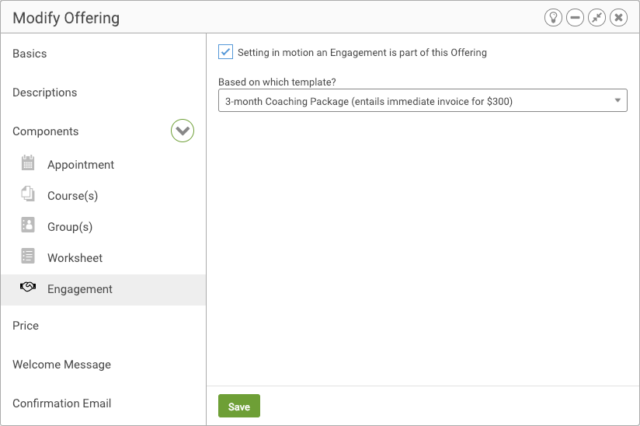 Offerings are a great way to sell coaching packages right from your website. When creating an Offering, you’ll notice a new component available. 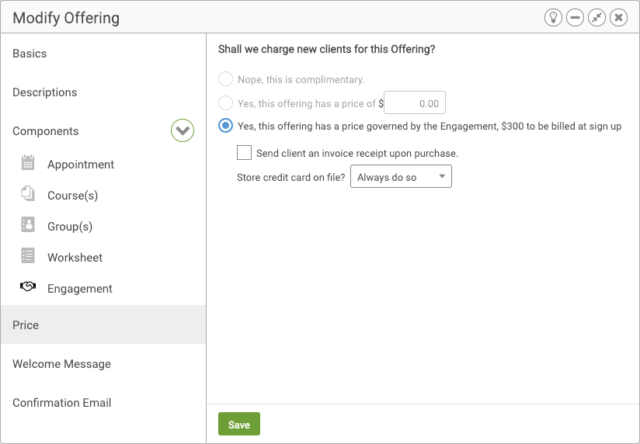 Where before you could have an Appointment, Course, Group, Worksheet, or all of the above for the new client as part of your Offering, you can now also have an Engagement be part of an Offering. When your Offering consists of an Engagement that entails multiple invoices, it might be a good idea to require the client’s credit card be stored on file for future invoices (i.e. the ‘Always do so’ option as seen above). This is a great way to ensure you’ll not be chasing down your clients to collect on invoices if it’s a subscription or installment payment plan you’re offering. If you use this, however, we suggest you add make note of that specifically in the Offering’s description, so as to be extra-transparent and respectful of your new clients. Payment Options: Installment Plans Available! Maybe you want to offer your clients options for a given coaching package: an installment plan or pay it all up front (and get a discount for it). To do this you would create an Offerings Bundle. Add the correct Offerings to the Bundle. More on setting up an Offerings Bundle here. In this example, you’d just set up one Offering paid monthly and a nearly-identical Offering paid all up front, add a little description of how it’s going to work, and create the Bundle. Your clients get to choose the one they prefer, and CoachAccountable handles the rest. With payments on autopilot you’re both better able to focus on the coaching. There’s power in being so specific: make what you’re selling easy to understand and easy to buy. As such by setting up your coaching packages as Engagements and selling them as Offerings you make your coaching clearer and more enticing to your prospects. What is your offering? What do you do? How do you work? These are all made easier to define (and have automatically tracked) with Engagements. Were you waiting for this big chunk of coaching business-stuff to start with CoachAccountable? Now’s the time; set up your free 30-day trial today.